24/7 Reliable Funeral Services - Call Now! 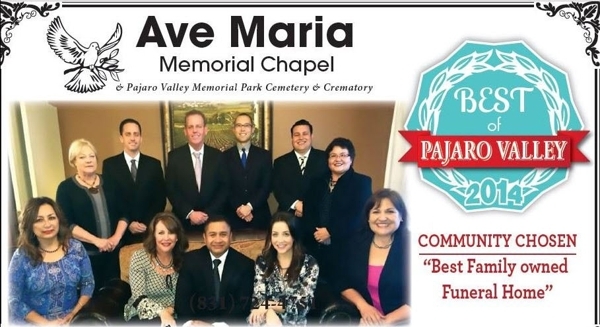 As a family-owned and operated facility, Ave Maria Memorial Chapel is dedicated in helping you share the wonderful stories that make this community great. We provide a place to cry, laugh, and most importantly, begin the healing process in the aftermath of losing a family member or friend. Whether traditional or unique, our expert staff will help you create an unforgettable celebration of life with detailed pre-planning and funeral service arrangements. Housed in a beautiful, serene 9,804-square-foot Spanish-style building, Ave Maria Memorial Chapel was transformed from a Victorian home in 1941. It features two arrangement rooms and three visitation rooms with plenty of parking available. We take great pride in providing a wide variety of choices including personalized services, cremation memorials and traditional funerals. Our staff understands that the loss of a loved one is a very personal experience and we feel privileged that our customers trust us to deliver a beautiful and unique service in preparing such a ceremony. Our facility, resources, and experts are at your service! Call Now to Speak with One Of Our Funeral Directors! Copyright © 2018 avemariamemorial.com All rights reserved.